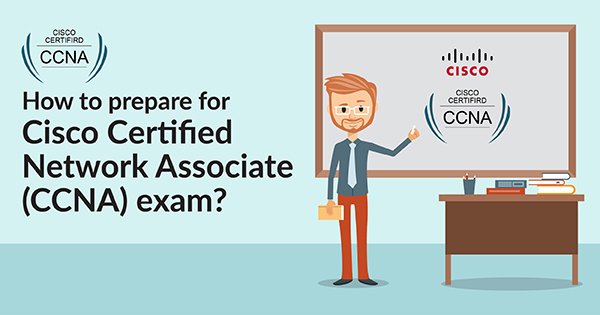 Preparing for Cisco Certified Network Associate (CCNA) exam? We’ve got you covered with the CCNA exam preparation guide. Cisco Certified Network Associate or CCNA certification has been growing in demand recently. It is one of the most sought-after certifications by the IT professionals. CCNA certification is offered by Cisco for the associate level networking professionals and hence the name. Subsequently, CCNA certification helps in boosting the career of an IT professional in terms of skills, knowledge, better job opportunities and increased pay. With this certification, an individual is likely to be capable of configuring, operating as well as troubleshooting various components such as switches and routers of a network system. In the blog, you will get the overall tips and strategies to prepare for the CCNA certification. Let’s have a look at the basic information and the objectives covered in the CCNA certification first. Before you take any exam or certification course, it is very important that you know the CCNA syllabus beforehand. 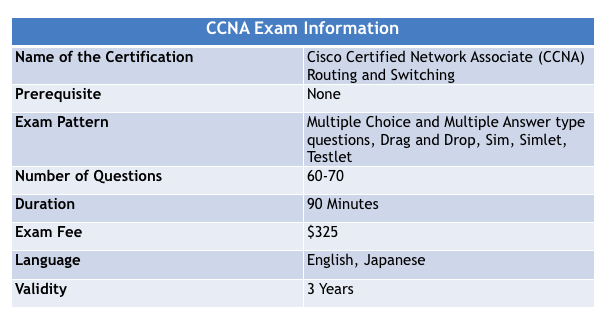 So, here is what the CCNA certification exam covers! This is the first module and it includes the most fundamental topics related to networks, such as TCP/IP protocols, firewalls, and various network topologies. It also has IPv4, IPv6 address types in details. This modules comprises of various switching concepts in a network; configuring, verifying and troubleshooting VLANs, inters witch connectivity, STP protocols, and EtherChannel. This module consists of several routing concepts along with routing table; types of routing, namely static and dynamic routing; interior and exterior routing protocols; OSPFv2 for Ipv4 and OSPv3 for IPv6; EIGRPs for both IPv4 and IPv6; and RIPv2 for IPv4. It includes a detailed study of configuration and verification of both PPP and MLPPP on WAN interfaces and PPPoE client-side interfaces using local authentication. It also covers WAN connectivity options, basic QoS concepts. This module includes topics like DNS lookup operation; troubleshooting client connectivity issues involving DNS; configuring and verifying DHCP on routers, basic HSRP, source NAT and NTP operating in a client/server mode. The infrastructure security module has the topics like port security, common access layer threat mitigation techniques, configuration, verification and troubleshooting of IPv4 and IPv6 access list for traffic filtering. Along with these, it also includes ACLs using the APIC-EM Path Trace ACL analysis tool, configuration verification and troubleshooting of basic device hardening. As the name suggests, it includes the management of the devices that constitute the networking system. The configuration and verification of device monitoring protocols are also included here. Device performance maintenance also comes under its ambit. Want to discuss something with the Networking experts? Just write in the Whizlabs Forum and start a discussion with the certified experts. The exam costs quite a good amount. So it is better you do the preparation well before taking the exam. Most of the Cisco exams cost around $300; only the exam CCNA Routing and Switching (200-125) costs $325. Other exams like ICND1 and ICND2 exams cost $165 each. However, you can also buy some exams for boosting your preparation; those exams are available online. The Cisco CCNA exam practice questions by MeasureUp for a month costs $139. The CCNA exam is mainly to check the fundamentals of a professional, thus it is likely that the level of exam questions will keep changing with the advent of newer technologies. However, there is a standard procedure that is followed in order to conduct the exam in a fair manner. The exam is objective type. You will be given multiple choices (uniform number of choices for every question) from which you will have to choose the correct answer. There will be other types of questions such as drag and drop, Simlet, Sim, and Testlet. The number of questions asked in the exam generally ranges between 60 and 70. The overall time limit for the exam is set to 90 minutes or one and half an hours. The CCNA exam is available in two languages i.e. English and Japanese. As already mentioned, the exam can be taken in two ways; so, if you are taking the CCNA routing and switching exam (200-120), then the best deal will be if you purchase the CCNA version of both the products. If you are worried about how to pass CCNA exam in the first exam, go through the available CCNA preparation material and get ready to pass the exam. Here is the brief of CCNA preparation material to complete your CCNA exam preparation. You will receive two books, namely, The Cisco CCENT/CCNA ICND1 100-101 Official Cert Guide and the Cisco CCNA ICND2 200-101 Official Cert Guide. They cover all the relevant topics from the syllabus. If you like reading in a questionnaire pattern, then you can avail the eBooks from the Cert Library. Additionally, you will also receive a study plan which will guide you through the course material. You can also avail the objective type questions from the books titled ’31 days…’ from the Cisco Press. This book is like a quick guide for the CCNA exam preparation and serves great if you are looking for ways to crack in your first attempt. Seeking expert support during your CCNA exam preparation? Feel free to contact us at Whizlabs Helpdesk, we’ll respond to you in no time. A planned approach to anything big is very much essential; as it will guide you throughout in gaining the right objective. Read the following tips that may help you in your CCNA exam preparation. Firstly, you need to have a little knowledge of the networking models. However, if you are new, then you may opt for the two exam pattern offered by Cisco, otherwise, one exam is enough. The exams are mentioned in one of the aforementioned sections. Secondly, you need to study in depth. Merely gathering knowledge won’t suffice. You will be required to test other networks using your knowledge, so be prepared to face challenges and thus, prepare accordingly. Practice CLI by buying those types of equipment or renting them, but do it. Simply understanding is not everything in this case. You have to understand the router and switch commands and configure them accordingly. Subletting is another important sphere where you need to focus. Practice it until it is as easy as ABC. Not only easy but try to make it fast too. Last but not the least, practice from the Cisco Learning Network. It is like a community; wherein you can post your doubtful questions and receive responses in minutes or hours. They even sometimes provide samples of questions similar to the real exam. How to Pass CCNA Exam in First Attempt? Well, anything is possible, if you have the right strategy and the determination to do anything that you desire greatly. Here are some tips on how to crack the CCNA exam in your first attempt. Firstly, find the practice and previous year questions of the exam on the internet. It will help you in gaining knowledge of the exam as well as the question pattern. Practice is the key to be perfect in anything. So, practice as much as you can. Lab practice is an added advantage, so if you can do that then it will be more than enough for your preparation. Look for the summaries and glossaries in books. Those are essential points and provide you the gist of any topic. It will help you in remembering the things easily too. There are many websites that provide the exam formats, check them and get the preview of the same and also check the weight of each topic in the question paper. While preparing, do not forget to assess your preparation. In order to do that, you must take mock tests that available online. The details are mentioned in the previous section. Lastly, you should go through the important topics. Since networking is a vast area, it becomes difficult to cover every topic. However, some fundamentals such as TCP/IP models, different protocols, data flow, and OSI model must be at your fingertips. Preparing for the CCNA certification exam? Check your current level of preparation with CCNA Exam Practice Questions. Firstly, get a certificate of the entry level if you are new to this networking genre. It will help you gain an insight into the fundamentals. Prepare for the CCNA exam with all the relevant materials and follow the strategies mentioned in this blog. Go for specialization in the field of networking. This will help you in gaining more knowledge as well as to become an expert in this field. As a result, job opportunities will increase. Finally, with all the above-mentioned things, having passed the exam, you will become a network administrator or software developer. You can design domains that will run smoothly and effectively. A CCNA certificate is likely to remain valid for three years. Thereafter, the certificate will be invalid and you will be required to recertify the same by taking an exam again. The new exam will consist of topics from the updated technologies along with basic course contents. In case of CCNA certificate, you need to take the Cisco CCNP certification before it becomes valid. However, if you take any higher level exam within those three years, you will not need to take any other exam for recertification. It won’t be wrong to say that the CCNA exam is one of the toughest exams in the IT industry. This certification helps the networking professionals to validate and demonstrate their skills. It serves as a huge opportunity for the IT professionals to grow in their career. With this certification, you become an expert in networking with a global recognition. If you are an aspired networking professional preparing for CCNA certification, this CCNA exam preparation guide will help you a lot to reach the goal. Along with this preparation guide, Whizlabs has brought CCNA practice tests that will help you get well prepared for the exam and be ready to pass the exam in the first attempt. So, join us today and take a step towards a bright career! Need an assistance in CCNA exam preparation? Just write in the comment section below and we will be happy to help you. Awesome Article..!!! This is very interesting blog. You mentions very helpful information for freshers as well as experienced.Really a good stuff, thanks for sharing great information in this blog. I have noticed that you have mentioned all things about CCNA Certifications. Thanks alot!!!! Hi Neeru!! I found your blog when i searching for how to prepare for CCNA exam. You tried to provide each required information related to CCNA course. It will help me and others to get certification. Thanks for the sharing this article with us.